Embarrassed with bad breath? Here is how you can treat it. Treatment for bad breath can vary, depending on the cause. If your bad breath is found to be caused by an underlying health condition, your dentist would ask you to consult a doctor to rule out the health problem to help you better control that condition. 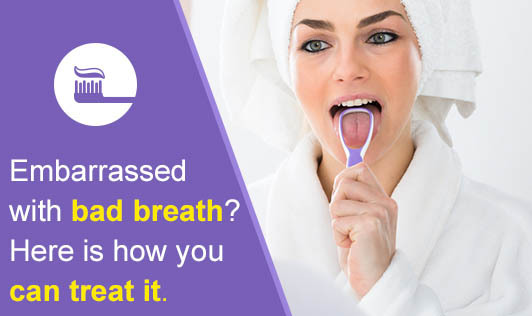 There are certain home remedies or self care tips that you could follow to get rid of bad breath. However, these could be temporary if there is an underlying medical problem. Brush your teeth after you eat. Make sure to brush at least twice a day and after meals with toothpaste. Brush your tongue. A tongue scraper/cleaner is more effective than a brush for reducing odors that originate from the tongue. Another option is to use a toothbrush with a built-in tongue cleaner on the back. These brushes reportedly work just as well as scrapers/ cleaner. Clean your braces, dentures well. If you wear braces to align your teeth, clean it thoroughly at least once a day or as directed by your dentist. Dentures should be removed at night and cleaned thoroughly before being placed in your mouth. Change your toothbrush every three to four months, and choose a soft-bristled toothbrush. Schedule regular dental checkups. At least once a year, see your dentist to have your teeth or dentures examined and cleaned. Keep your mouth moist. Be sure to drink plenty of water. Avoid coffee, soft drinks or alcohol, which can lead to a drier mouth. Adjust your diet. Decrease alcohol and coffee intake and avoid other food and beverages that can precipitate bad breath. Eating fibrous foods like whole grains, vegetables and fruits can help. Avoid tobacco: Stop smoking/ chewing tobacco-based products. Mouthwash: There are a number of mouthwashes and mouth sprays available in the market these days. However, keep in mind that many of these mouthwashes generally provide only a temporary way to mask unpleasant mouth odor. There are, however, several antiseptic mouth-rinse products that kill the germs that cause bad breath instead of just masking the odor. Ask your dentist about which product is best for you. If you have bad breath, meet your dentist today!